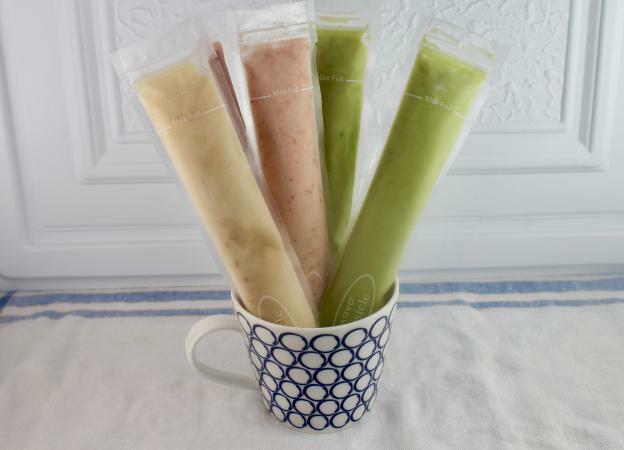 Ice candy, which comes from the Philippines, is a more exotic version of American popsicles. It is a frozen treat made with coconut milk or cream and sweetened condensed milk and flavored with everything from pureed avocado to chopped candy. The dessert is frozen in a plastic tube. To eat it, you cut or tear off the top and push the frozen mixture up from the bottom as you eat. 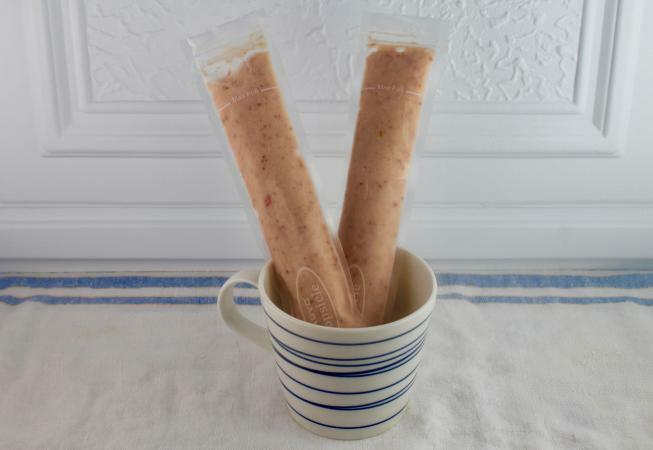 To make ice candy, you will need plastic sleeves or tubes that are made just for this dessert. You can find them online or at specialty stores, and sometimes in ethnic markets. The sleeves are about 1-1/2" in diameter, and about 10" long. They are either tied at the top with string, or some use a Ziploc fastener. If you don't have the tubes, you can use plastic sandwich bags. Put about 1/3 cup of the base into the bag, then carefully fold down the top of the bag until you reach the base. Fasten the bag closed with some kitchen twine or rubber bands. It's nice to have a blender or food processor to make this recipe, especially if you are going to add fruits or vegetables to the base. You can mash the produce instead and add it to the sweetened milky base, but the finished product will not be as smooth. A funnel to help pour the base into the sleeve will help make filling the sleeves easier. Or you can use a glass measuring cup with a spout. These green treats are a colorful summer delight. Combine the coconut milk or cream, water, cornstarch, and sugar in a large saucepan. Over medium high heat, bring the mixture up to a boil. Stir the mixture frequently with a wire whisk. Cook until the mixture thickens a little and starts to steam. Don't let the mixture get to the boiling point. Remove the saucepan from the heat and whisk in the sweetened condensed milk, then let stand for 1 hour, stirring occasionally. Now peel, remove the pit, and cube the avocado. Put the avocado, lemon juice, and 1 cup of the coconut milk mixture into a food processor or blender. Blend or process until smooth. Stir the pureed avocado mixture into the rest of the coconut milk mixture. Using a funnel or a measuring cup with a spout, pour about 1/3 to 1/2 cup of the mixture into the sleeves or a plastic baggie. Some sleeves will have a "maximum fill" line, since the custard will expand as it freezes. Continue until all the mixture is in the sleeves. Fasten the sleeves closed securely. Place in the freezer and freeze until firm, about 5 to 8 hours. Juicy strawberries are a great flavor choice. Combine the light cream, water, powdered sugar, and cornstarch in a large saucepan. Bring to a boil over medium high heat, stirring frequently with a wire whisk. Cook until the mixture thickens slightly and starts to steam. Don't let the mixture boil. Take the saucepan off the burner and whisk in the sweetened condensed milk. Allow the mixture to stand for 1 hour, stirring it occasionally. Put the strawberries, lemon juice, and 1 cup of the cream mixture into a food processor or blender. Blend or process until smooth. Stir the pureed strawberry mixture into the rest of the light cream mixture. Using a funnel or a measuring cup with a spout, pour about 1/3 to 1/2 cup of the mixture into the sleeves or a plastic baggie. Seal the sleeves or the baggies as you work. Continue until all the mixture is in the sleeves. Place in the freezer and freeze until firm, about 6 to 8 hours. 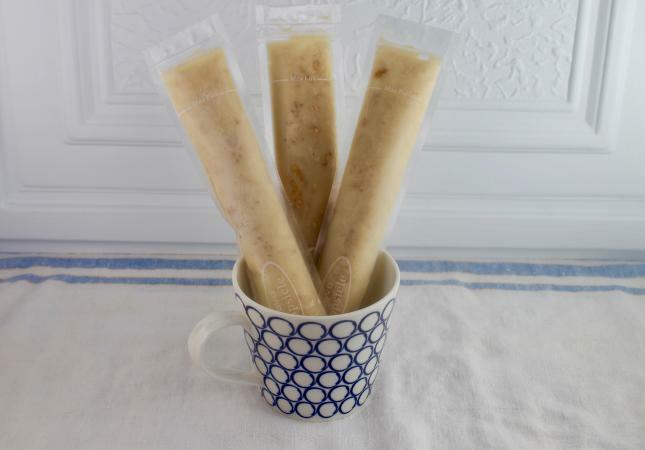 Take care of your sweet tooth with a toffee version of ice candy. Combine the light cream, water, brown sugar, and cornstarch in a large saucepan. Cook until the mixture has thickened slightly and starts to steam. Don't let the mixture boil. Remove the saucepan from the heat and whisk in the sweetened condensed milk and vanilla, then let stand for 1 hour, stirring occasionally. Stir the toffee bits into the cream mixture. Using a funnel or a measuring cup with a spout, pour about 1/3 to 1/2 cup of the mixture into the sleeves or a plastic baggie. You may want to spoon some of the toffee, which can sink to the bottom of the custard, into each sleeve as you work. Continue until all the mixture is in the sleeves. Seal the sleeves or the baggies. Place in the freezer and freeze until firm, about 6 to 8 hours, turning the bags occasionally so the toffee bits don't settle to one side of the sleeve. Try swapping out the flavorings suggested for your favorites. There are so many types of fruits and veggies you can try. Puree some peeled and sliced peaches, or try raspberries or blueberries. Applesauce would be good, as would fruit juices instead of the water. Even some cherry tomatoes would make an interesting ice candy. Think about using chopped candies in a recipe. For instance, flavor the cream base with some peppermint extract, then add some chopped chocolate covered mints. Or melt buttermints into the cream base when you add the sweetened condensed milk. The ice candy should be stored in the freezer. 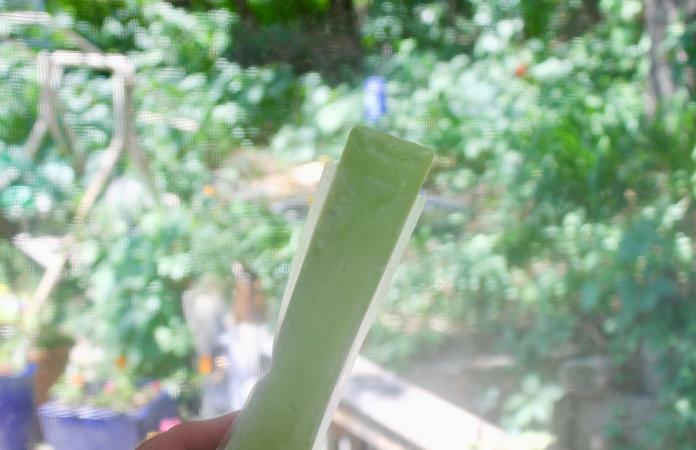 Keep a good supply of these ice candies on hand in the freezer in the warm summer months. It's the perfect summer dessert, especially for little kids. In fact, let the kids help make them.